The Magnavox Co. v. Activision, Inc. 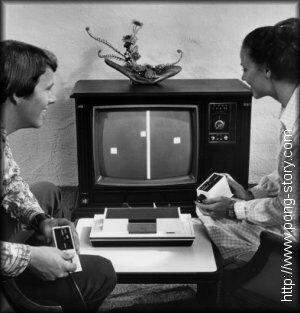 In a case of infringement involving one of the earliest video game patents, Magnavox asserted its exclusive licensing rights on television console “ball and paddle” games like the classic PONG. means for generating a hit symbol including means for ascertaining coincidence between said hitting symbol and said hit symbol and means for imparting a distinct motion to said hit symbol upon coincidence. 52. The combination of claim 51 wherein said means for generating a hitting symbol includes means for providing horizontal and vertical control signals for varying the horizontal and vertical positions of said hitting symbol. Deciphering the above legalese, the ‘507 patent described a common gaming scenario: a player (the hitting symbol) moving around the screen and making contact with a ball (the hit symbol), sending the ball off in a different direction. Sanders, having become a TV console gaming pioneer, had now secured the rights to a set of actions that countless video game designers would want when creating sports games, combat games, and puzzle games, etc. In 1971, Sanders sold the exclusive licensing rights under the ‘507 patent to Magnavox, who shortly thereafter introduced the first of the ball and paddle, under the name “Odyssey.” It didn’t take long for other game designers to catch on. Atari released the television console classic “PONG” in 1975, after securing a license from Magnavox for the right to make and sell the ‘507-type ball-and-paddle game. More game designers flocked to this new market, and Activision was among the youngest and most ambitious of them. Activision designed and manufactured television console games for the Atari 2600, the Commodore 64, and for IBM and Apple computers. It produced a Tennis, Hockey, and Grand Prix game, among others, which followed the general ‘ball and paddle’ format covered by the ‘507 patent. When Activision failed to obtain a license from Magnavox before developing these games, Magnavox and Sanders filed this infringement suit. Magnavox had much at stake in this case; they had already made approximately $40 million in licensing royalties based on the ‘507 patent and had no desire to be cut out of the loop. The stakes were raised even higher when Activision responded to the infringement action by promptly challenging the validity of the ‘507 patent with 9 pieces of prior art brought before the court. If the court invalidated the ‘507 patent, Magnavox risked losing its entire royalty stream, and being left completely behind by Atari and its television gaming competitors. Fortunately for Magnavox, the ‘507 patent had previously endured and survived validity challenges in two previous cases. In, The Magnavox Co. v. Chicago Dynamic Industries, 201 U.S.P.Q. 25 (N.D.Ill.1977) and The Magnavox Co. v. Mattel, Inc., 216 U.S.P.Q. 28 (N.D.Ill.1982), ‘507 patent had been challenged against many of the same pieces of prior art offered by Activision. However, since Activision was not a party to those cases, the judge in this case performed an exhaustive review of the technology and the cited prior art references before making an independent decision. In the end, as in the previous cases, the court found that ‘507 patent was valid over the prior art. After holding that Activision’s games did literally infringe, the court further noted that the Doctrine of Equivalents would have also applied in favor of Magnavox. Magnavox had enjoyed wide licensing and much commercial success based on the ‘507 patent. These facts justified a wide range of equivalents, and support the conclusion that Activision’s games were substantially the same as those claimed in the ‘507 patent. Activision next argued that since Atari had acquired a license from Magnavox to develop games under the ‘507 patent, all purchasers of the Atari 2600 console had either an explicit or implied license to buy and use other games falling under the same patent. The court quickly rejected the explicit license argument, holding that Atari 2600 purchasers only had a license to use that gaming console, not to buy and use other infringing games. Similarly, Atari console buyers did not acquire an implicit license to buy and use Activision games. No evidence had been shown that any game purchasers relied on this legal theory of implicit licensing while purchasing an Activision game. Further, any thoughts by purchasers concerning their freedom to use Activision games came from Activision itself and not from statements or actions of the Plaintiffs. The court similarly dismissed Activision’s argument that using its games in an Atari console constituted a “permitted adaptation” of the license given to every purchaser. The only minor victory for Activision came when the court found that its infringement of the ‘507 patent had not been willful. Activision’s founders, before starting the company, had brought their business plan to a patent attorney to seek legal advice regarding their proposed games. Since their counsel had failed to mention the ‘507 patent, Activision had acted reasonably in believing that there was no such patent.